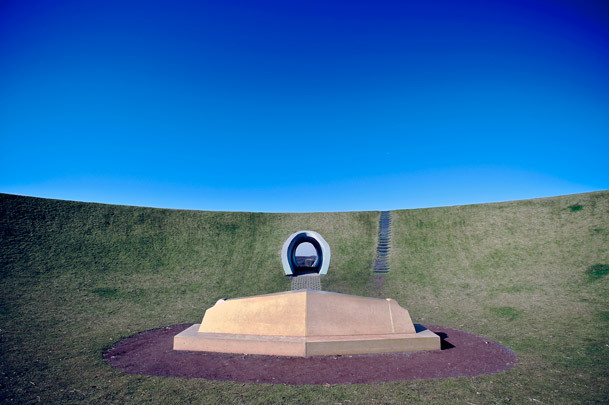 In the dunes of The Hague the American artist James Turrell created an artificial crater from which visitors can gaze at the sky. The ellipse-shaped bowl, its slopes sown with grass, is 40 metres long and 30 metres wide and surrounded by a five-metre wall of earth. Visitors enter the space through a concrete passageway. At its centre is a monumental bench on which two people can lie back. Seen from there, the light seems to curve so that the sky is seen as a vault. An identical bench stands on the crest of a nearby dune.